Most precious metals futures advanced Monday in their start to the new trading week. 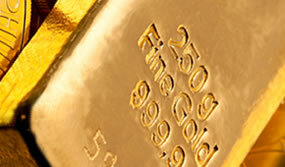 Gold and silver moved ahead for a fourth straight session with each closing around one-and-a-half week highs. Palladium, meanwhile, declined for the first time in five sessions to slip under its all-time record. Gold for December delivery tacked on $2.30, or 0.2%, to close at $1,225.30 an ounce on the Comex division of the New York Mercantile Exchange. The settlement was the highest since Nov. 7. "The fact that investors have revisited gold as a major safe haven will keep it to top of mind as the year ends," MarketWatch quoted Alfonso Esparza, senior market analyst at Oanda. "The U.S. dollar has appreciated against all major pairs year to date but as the [Federal Reserve] nears a neutral interest rate it runs the risk of running out of steam." Gold futures ranged from a low of $1,218.50 to a high of $1,226.50. They advanced 1.2% last week. Last Tuesday, they finished at $1,201.40 an ounce for their weakest settlement since Oct. 10. Silver for December delivery rose 2.1 cents, or 0.2%, to settle at $14.403 an ounce. The close was the highest since Nov. 8. Silver futures traded between $14.32 and $14.42. They surged 1.7% last week. January platinum added $11, or 1.3%, to $857.60 an ounce, ranging from $845 to $858.60. Palladium for December delivery declined $13.30, or 1.2%, to $1,141.30 an ounce, trading between $1,140.50 and $1,167.10. On Friday, the precious metal ended at a record of $1,154.60 an ounce. Both metals gained last week with platinum rising 1.1% and palladium soaring 5.2%. Gold dipped 80 cents, or less than 0.1%, to 1,221.60 an ounce. Silver rose 7.5 cents, or 0.5%, to $14.36 an ounce. In LBMA results last week, gold increased 0.9% and palladium advanced 5% while silver slipped 0.4% and platinum lost 1.9%.